As he was preparing to retire in 1976 as the second dean of the UF College of Journalism and Communications, Dean John Paul Jones authored a history of the College’s first 50 years. Published in the Winter 1976 issue of the Communigator, Jones takes a thorough – and oftentimes humorous – look back at those years. After his retirement as Dean in 1976, Jones returned to teaching and worked as a writer and magazine publisher until his death in 2001. The first Department of Journalism at the University of Florida was born to hard times, a ghostly specter that never left it during the first quarter century of its existence. The year was 1925. The place was the dimly-lighted basement of Language Hall, known today as Anderson Hall. Language Hall served the University as its administration building and one of its major classroom buildings. Even so, the basement of this prestigious place was dank and smelly, for the building was already middle aged. Despite the fact that Florida’s economy, which had flown so high and colorfully during the Great Land Boom, was now coming apart at the seams, the department was launched in grand style. Walter Williams, dean of the University of Missouri School of Journalism, came to Florida to install one of his students, Orland K. (O.K.) Armstrong, in his first journalism class. Armstrong later became a distinguished congressman from the state of Missouri. Journalism was listed as a department in the School of Business Administration and Journalism and Armstrong, with B.J., LLB, and MA degrees, was its head. In 1925 J. Francis Cooper was listed officially as an instructor in journalism in the College of Agriculture. Ralph Stoutamire was listed as an extension journalism instructor. When journalism became a part of the College of Commerce and Journalism in 1927, the College was administered by Dean Walter J. Matherly and the first official department head was Elmer J. Emig, a University of Wisconsin journalism graduate. 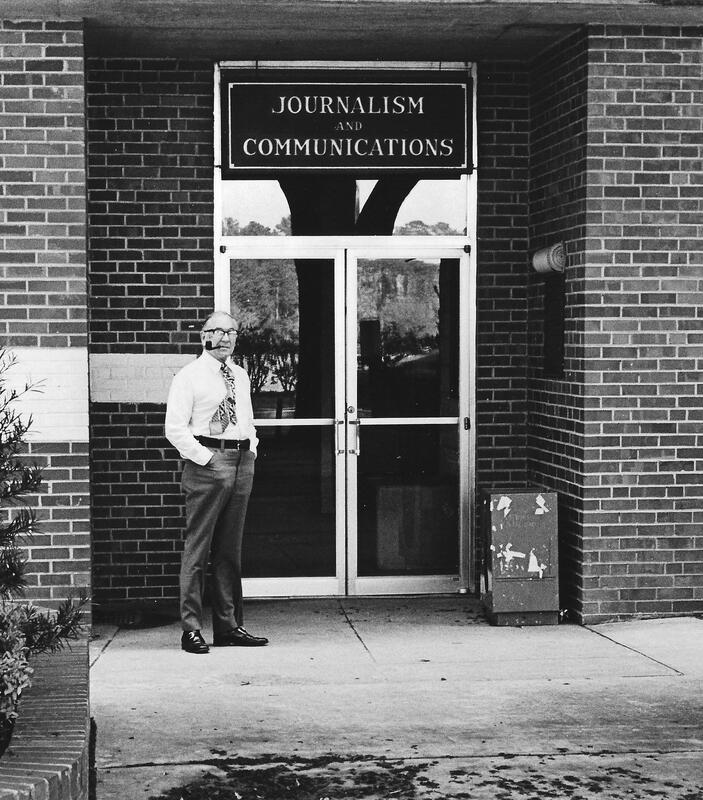 Journalism remained as part of the College of Commerce and Journalism until 1933 when it was returned to the College of Arts and Sciences as a department and the College of Commerce and Journalism became the present College of Business Administration. Professor Emig headed the department for nearly 25 years, lending it dignity and creating an aura of professionalism that graduates of those early years carry to this day. This tall, Lincolnesque man had little patience with dullards or students who wasted their time, particularly if they were bright. His soft words of reprimand were deadly to the scholar who came yawning and late for an eight o’clock class. His questions for an unprepared student cut like a knife, followed by a long, seemingly endless silence. But, he would go to the ends of the earth to help a student who showed promise. All students agreed that their journalism professor was a man who forced them to think. Students today talk about engaging in dialogues with their teachers. Professor Emig was doing that 50 years ago. Every class section consisted of a probing attack into some student’s unwilling and unresponsive mind. But the probing continued until the student was forced to think in self defense. When this finally happened, Professor Emig would lean back with a sigh and an impish grin would steal triumphantly across his face. He had won. Early in the history of the department, a second teacher, William L. (Bill) Lowry, a practical printer and newspaperman, joined the faculty. He was friendly and outgoing and quickly found a warm spot for himself in the hearts of all the students. The department in those days consisted of a single classroom, no typewriters, no equipment of any kind, an office for the chairman of the department and one for Lowry. Majors in the department numbered about 20 and by 1937 the size of the graduating class had reached an even dozen. As a means of providing students with practical experience Sigma Delta Chi, the student professional society for journalists, formed teams of students who spent their weekends in Ocala, Palatka, Tallahassee and Gainesville, “putting out the paper.” In addition, most of the staffers of the weekly FLORIDA ALLIGATOR were journalism students. And journalism students were plentiful on the staffs of the University yearbook and the literary magazine, THE FLORIDA REVIEW. In 1937, the department was moved from Language Hall to Buckman Hall, a dormitory that had been one of the first buildings on campus. One end of the second floor was renovated to provide a classroom and two offices. One of the offices had been converted from a dormitory bathroom and the toilet pipes remained against one white-washed wall. Students who visited the journalism faculty member for counseling frequently had to sit quietly waiting for the pipes to cease their loud gurgling whenever a dormitory resident flushed the toilet. It was a kind of “out of sight, out of mind” situation. Despite these humble beginnings the department’s graduates distinguished themselves in the world of journalism. Ben Grant became a top executive for U.S. NEWS AND WORLD REPORT in Washington, D.C. Howard Norton became a foreign correspondent, first in Tokyo and then all over the world. His later employer was the BALTIMORE SUN. Today, he is White House correspondent for U.S. NEWS AND WORLD REPORT and is near retirement. 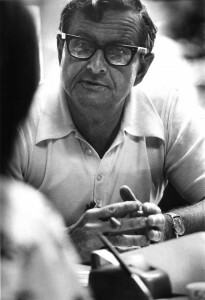 Lester Barnhill became Sunday Editor and later National Advertising Director for THE MIAMI HERALD. Al Cody went into the printing business in Kissimmee and developed one of the largest commercial printing businesses in the state. Sam Talbert became dean of the school of journalism at the University of Mississippi and Allen O. Skaggs, Jr. served the University of Florida for many years as director of the News Bureau. Talbert and Skaggs are deceased. Dave Parrish is a successful lawyer in Miami and Herbet McNeal recently retired after many years with the United States Navy, first as an officer and later as a civilian manager of the U.S. Naval Base in Cuba. Irving Ashkenazy, who worked his way through College as a professional boxer, has become a successful movie writer in Hollywood, after a number of years in London as an advertising writer for the J. Walter Thompson Company. Ashkenazy, a poet, founded THE FLORIDA REVIEW in 1931. Bill Chambers was public information director for a number of large Florida organizations before becoming Dean of Development for the University of South Florida. Today, he heads his own public relations firm. Fred Pettijohn is general manager of THE FORT LAUDERDALE NEWS and Odell Griffith is author of two recently published biographies of Florida personalities. Griff heads The Griffith Agency, a public relations and advertising business in Pensacola. Ralph Davis has been one of the most enduring and distinguished of Florida’s public servants in Tallahassee. He has served as executive secretary of the State Road Department during the terms of several governors. Tom Leonard bought his own weekly newspaper in Milton, Florida, and built into a prosperous publishing enterprise before his untimely death in an automobile accident a few years ago. He had served as president of the Florida Press Association in 1955. Clay Codrington bought the PLANT CITY COURIER and developed it into one of the most respected of Florida’s weekly newspapers. 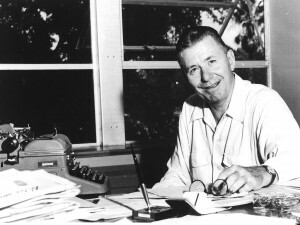 He also served as president of the Florida Press Association in 1957. H.G. (Buddy) Davis, presently a professor of journalism in the U. of F. College of Journalism and Communications, was a capital correspondent for the FLORIDA TIMES UNION before joining the faculty. He has distinguished himself as a teacher and an editorial writer, winning a Pulitzer Award, the Sidney Hillman Award, a Sigma Delta Chi Award and many state education association awards for his editorials in the GAINESVILLE SUN. Frank Wright was a long-time director of public information at the University of Florida, a civic leader throughout the state, and later founded his own public relations firm in Palm Beach. Frank Rathbun, a member of today’s faculty of the College of Journalism and Communications, served in the Army as a colonel, primarily in public information in the Pentagon during his years after World War II. 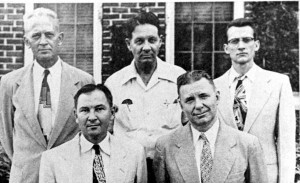 Just for the record, the first students to graduate from the University of Florida with journalism degrees were: Wallace Jerrold Bulloch, Monticello; Malcolm LaMar Fordham, Bradenton; and Paul Rutherford Robertson, Vero Beach. All three received BS degrees in 1928. These are only a few names, selected at random, from the 158 students who were graduated with journalism degrees during the first 25 years of the department, years that spanned the Florida Boom and Bust, the Great Depression and World War II. Nobody knew. The entire class flunked the test. Bill Lowry served as acting head of the department during World War II while Elmer Emig again served in the Armed Forces. He had served in World War I. During those years students were few in number, so few that Lowry also served the University as director of public information. 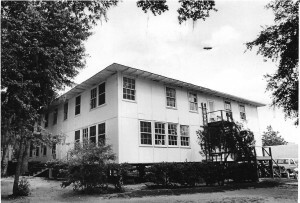 After World War II, the department was moved to Building E, just west of the present Tigert Hall. There was still only one classroom, no equipment and only two teachers. A third faculty member, John Paul Jones, a 1937 graduate of the department who had received his M.A. from Wisconsin and was teaching at the University of Illinois School of Journalism, was hired in the fall of 1948. 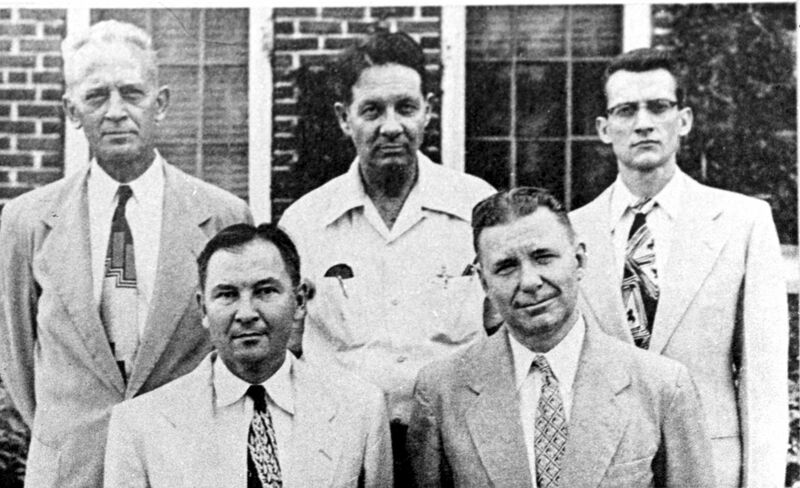 During that year, a committee of newspaper publishers from the Associated Daily Newspapers of Florida, Herbert Davidson, editor-publisher of the DAYTONA BEACH NEWS-JOURNAL, William Pepper, Jr., editor of the GAINESVILLE SUN, and Henry Wrenn of the TALLAHASSEE DEMOCRAT, met with J. Hillis Miller, president of the University of Florida, about forming a School of Journalism and naming a nationally-known journalist to head the new and expanded program. President Miller agreed, and Rae O. Weimer, former managing editor of PM, New York City, was hired to direct the new school in the College of Arts and Sciences. The new School began under the same specter of poverty, but Weimer, a long-time warrior against poverty who had been in newspapering when he only got a new copy pencil by turning in the stub of the one he had worn out, showed his mettle from the beginning. He managed to get the new school moved to Building K, a temporary, two-story barracks-type building south of Florida Gymnasium. In this move, the School obtained 3,000 square feet of space, including a newsroom, a classroom, a department office and several faculty offices. The classrooms soon had typewriters like any respectable city room and Bill Lowry was ecstatic when he received his first shipment of type for the new typography laboratory. Then, he explained how it was used in the printing process. The new typography lab changed all that. Now he could have the students learn printing processes by actually setting type. 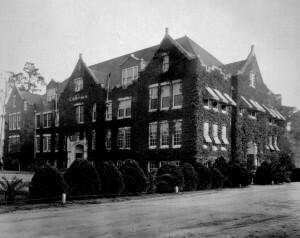 Building K was located at the site of the existing Weimer Hall. There were problems with Building K. The walls were paper-thin and Rae Weimer was a “shouter” on the telephone. The building was unbearably hot in the summer. Weimer kept a thermometer on his office wall and when the gauge showed one hundred he called the president’s office and reported the temperature. This was a regular occurrence in the summer and eventually resulted in the School being moved to the football stadium in the fall of 1955. During the years in “K” the name of the School had been changed from the School of Journalism to the School of Journalism and Communications. Added to the mission was the training of professionals for the radio and television industries. Also, prior to the move to the Stadium, the School had become the state headquarters for the Florida Press Association. John Paul Jones was named the first secretary-manager for FPA, an additional duty to his teaching responsibilities in the School. One of Rae Weimer’s first goals was to get the School’s programs accredited nationally by the American Council on Education in Journalism. This he accomplished in 1950 when accreditation was granted in the news-editorial sequence. Advertising was accredited in 1955 when the news-editorial program was re-accredited. 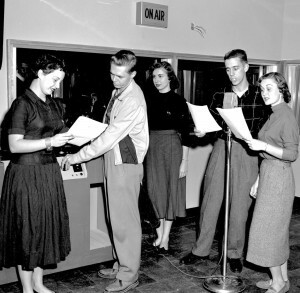 During the School’s 1956-1958 biennium, the broadcasting program received national accreditation. The School has maintained its national accreditation ever since and today is seeking accreditation for its Public Relations Department. The fact was and is that there are no entrances into the Stadium seating area from the journalism quarters. Many professors who had work to do in their offices over a football weekend were forced to labor amid all the screaming and pandemonium of an exciting football game. Another interesting feature of the Stadium journalism quarters was the huge supporting concrete and steel columns that were needed to support the stands. Sometimes these went through the middle of a classroom or a television studio. A classroom seat behind one of these columns was a preferred location. Rae Weimer ran the School of Journalism and Communications with vigor and enthusiasm. He liked students and was always available to them at the office, at home, at night, on weekends, during vacations. No student’s problem was too small for him to handle. No job at the School was too insignificant for him to do. He arranged furniture in the classrooms, hauled mailbags up the stairs, opened newspapers, answered his own telephone, mopped up the halls on a Sunday afternoon if a leaking pipe had flooded the place. He believed in instant communication with those he needed for information or advice. He had a system of inter-com boxes installed in the Stadium with key persons so with the flick of a switch he could be in contact. The School became the fastest-growing journalism unit in the nation and the fastest-growing of all the units at the University of Florida. The School inaugurated closed-circuit television teaching in Florida. The School had the first nationally accredited professional journalism and communications programs in Florida – and maintains that “first” still. The School installed the first chapter of Theta Sigma Phi, national honorary fraternity for women, in Florida, and the first chapter of Kappa Tau Alpha, national scholarship fraternity for journalism students. The School co-sponsored a half-million dollar project for filming a high school chemistry course. The School was designated in 1959 by the Board of Control as the only state supported School of Journalism in Florida. The School set up Radio Center to provide the radio stations of the state with program material produced at the University of Florida. The School provided the Florida Scholastic Press Association with state headquarters and provided the office with a director. The School established the High School Press Institute, a summer program to help train high school newspaper and yearbook editors and other staff members. The School became the first, and only, Florida journalism unit to compete in the National Collegiate Writing Contests sponsored by the William Randolph Hearst Foundation. Students entered the contest in 1961 for the first time and came in fourth in the nation. In succeeding years, the School moved up to second place and then in 1965 won first place. The award was presented by President Lyndon Johnson at the White House. Through 1975, the College had won this national honor six times, more than any other school in the United States. About this same time, 1961, the School set up its first photography laboratory and began teaching photojournalism. 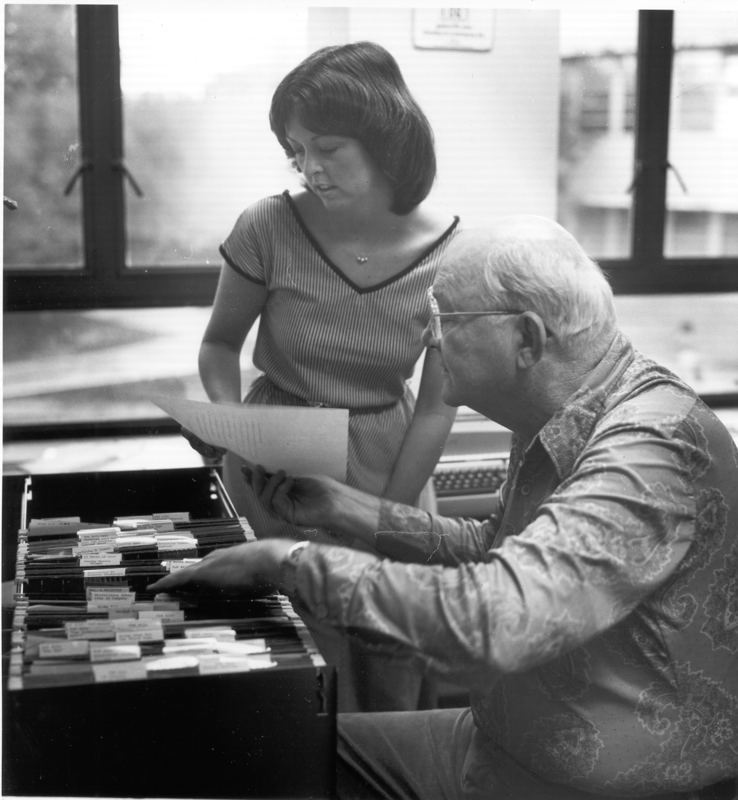 By the end of the Weimer years in 1968, the School had become a College of Journalism and Communications, had 633 majors and had graduated 1,250 students between 1949 and 1968. This was almost ten times as many as had been graduated in the previous 25 years. In addition to phenomenal growth in enrollment and facilities, the Weimer years were noted for good teaching and the reputations developed by a number of the School’s faculty. Hugh Cunningham became known throughout the state in newspaper circles for training first-rate newspaper men and women. His course in Applied Journalism at the GAINESVILLE SUN became an institution. Cunningham was a newspaperman’s teacher and he kept his students under the pressure of newspaper deadlines from daylight until late afternoon, two days each week for each of two sections of Journalism 450. When Hugh certified a student as ready for a job, that student was indeed ready. H.G. (Buddy) Davis also gained a reputation throughout the state in newspaper and alumni circles for being a harsh taskmaster in the beginning reporting course. His “crown of thorns,” awarded with great ceremony to the errant student, became one of the long-remembered traditions of the College, along with his fire and train wreck stories in which Buddy acted out various characters in the disaster and was then interviewed by class members. Harry H. Griggs, whose dry wit and good humor became another School tradition, built the present excellent graduate program almost from the ground up. His masters graduates are scattered throughout the nation, one being a college president, another an executive in Proctor & Gamble’s international advertising program in Rome, Italy, many others in teaching jobs, and still others in responsible Army positions. Several are members of the present College of Journalism and Communications staff. John V. Webb made his name in the area of typography and graphic arts and was the first teacher to produce a complete course in typography for television teaching. John later became assistant dean of the College. One of his most important, longtime services to the College and the high school press was his service as executive secretary for the Florida Scholastic Press Association, housed in the College. Jo Anne Smith, a former United Press sports editor, became known for her course in communications law and good teaching. She was named outstanding teacher in the Department of Journalism a number of times after that department was formed. She was twice named one of the outstanding teachers in the University. Kenneth A. Christiansen achieved a national and international reputation for his knowledge of educational television. His services as a consultant in this area were in demand in India, England and the Far East, as well as in the United States. Ken was also known for excellent teaching and sound educational practices. There were others who will long be remembered by graduates. Mickie Newbill Edwardson, who pioneered with Radio Center and made it a living force in the state; Manning D. Seil whose advertising classes were literally hated but when it was all over and the graduates were out on the job they sang this tough instructor’s praises; and Charlie Wellborn, who came on the scene rather late after retirement from the Army, but quickly installed himself in the hearts of the College’s graduates. By the time John Paul Jones became dean of the College in 1968 a kind of panic had set in. The enrollment growth line was headed almost straight up, the Stadium had suddenly become a sardine can, with leaks and cracks and no key with which to open the top. Between 1968 and 1975 enrollment went from 633 to 1,250 and back to 1,100 when an enrollment cap was forced on the sardine can. Crises came by the dozen as faculty size went from 32 to 44 and the College was departmentalized in an attempt to ease the administrative burdens. In the midst of all this the news-editorial, advertising and broadcasting sequences were re-accredited in 1970. In 1969 the administration of radio stations WRUF-AM and FM was placed in the College and students continued to beat all journalism schools in the nation in the Hearst writing contests. Advertising teams competed in national contests and usually finished among the top five. A team of television news students won first place in a Southeastern States competition for professionals. The College placed an intern in the Sears Congressional Internships four times in five years in competition with all 60 of the nation’s accredited schools. During those same years students won two magazine internships in New York City. In 1970 the Board of Regents created four departments in the College: Department of Advertising, Department of Broadcasting, Department of Journalism and Department of Public Relations. In 1972 the first chairpersons were selected. 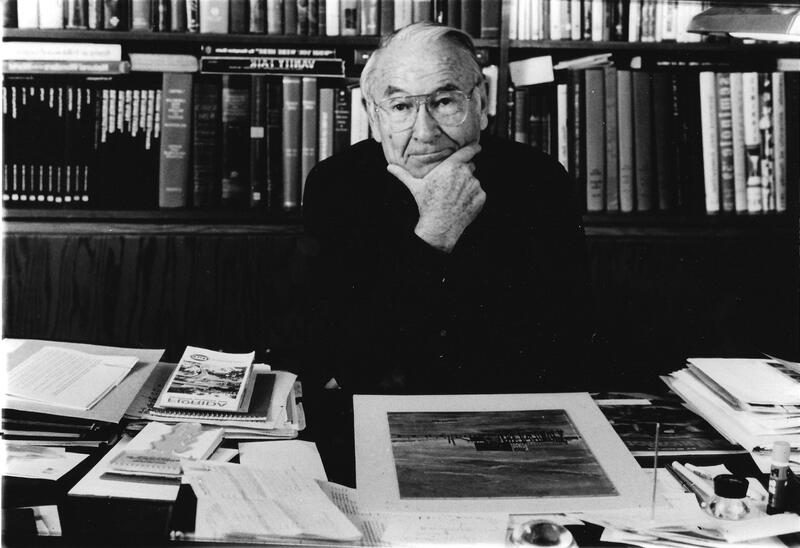 Dr. Frank Pierce, from the University of Texas, became the first chairman of the Department of Advertising. Dr. Kenneth A. Christiansen became Broadcasting chairman, Dr. John Griffith was named Journalism chairman and Dr. Glenn Butler headed the new Department of Public Relations. In 1968 an effort was begun to get new facilities for the College. This continuing effort bore fruit in 1973 when the Gannett Foundation of Rochester, New York, gave the University one million dollars for a new building for the College. There was one stipulation. The College was asked to raise another three quarters of a million dollars from the communications industry to help pay for the building. By the fall of 1975 the additional three-quarters of a million was near with $680,000 pledged, or donated in cash. An architect had been hired to do the initial planning for the building. A site had been selected – across from the Florida Gymnasium to the south, on the site of Building “K,” the old home of the School. A five-story, 100,000 square foot building was recommended by the architect. In the fall of 1975, the College received the first annual payment for work/scholarships made possible through the estate of Karl and Madira Bickel. Twenty undergraduate and six graduate students received some $35,000 in funds to aid in their education. Annual funds from the Foundation set up by the will of Karl and Madira Bickel will amount to about $25,000. Bickel was a longtime president of the United Press in New York City. These funds constitute one of the largest single scholarships programs in the United States for journalism students. One of the outstanding developments of the years between 1968 and 1975 was the growth and development of the Graduate Division and the Communications Research Center. Graduate enrollment, master’s level, grew from 20 in 1968 to around 70 in 1975. For 13 years the Graduate Division was headed by Dr. Harry H. Griggs. In 1969, Robert Simmons, a Ph.D. degree candidate at Minnesota, was named Director of the Communications Research Center. Later Dr. Ramona R. Rush assumed this directorship. In 1975, Dr. Rush became head of graduate studies and research as Dr. Griggs returned to teaching and research. Dean John Paul Jones Jr. In the fall of 1975, Dean Jones, nearing age 65, announced that he would retire as dean at the end of the 1975-76 academic year. One of the strange coincidences of this tale of 50 years is that the College had come full circle – it began as a School of Business Administration and Journalism in 1925, quickly became a College of Commerce and Journalism, reverted back to a department, then became a school again and finally ended up almost where it had begun, as a College. 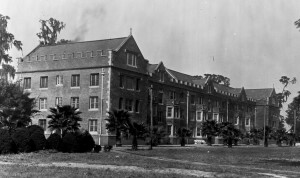 As a College of Commerce and Journalism in 1927 it became the second largest College at the University of Florida with nearly 900 students. After the journalism unit dropped back to departmental status, it took about 40 years for the enrollment to climb back to 900.